(..and of suns and moons, of archangels with swords and little silver fish); bizarre as it sounds, these things make up the main substance of the story of my week. As though intent on taking me on a journey that has run parallel with the literal travels of the past few days, these oft-repeating clues have turned up time-and-time-again, made up of coloured threads that were long-ago stitched into the tapestry of my life (long before they seemed to hold personal significance); catching my eye anew, not as tatty old threads but as bright-shiny-new and, above all, current and meaningful nudges that lead to fresh understanding. By their lead, it is as though life has simply unfolded this week, taking me on its own adventure as I have sat back and watched what it has to show me. It began with a planned trip to the Cotswolds, all built around a long-overdue visit to Kelmscott Manor, one-time home to William Morris. 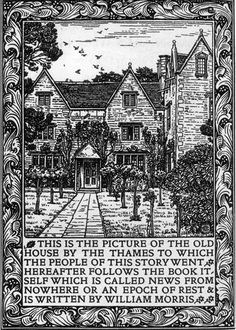 It occurred to me in the late summer that I had never, yet, been there for all Morris has been such an influence on my life and so we built an entire holiday around it, planning to visit Kelmscott on its very last day of opening for 2014. For that same week, by chance, we also had a trip planned to London to visit Paul Cummins’ poppy installation at The Tower of London (written about in two previous posts). It was only as the London trip approached, and I searched for any London exhibitions that happened to be on that week, that I tripped upon ‘Anarchy and Beauty’ at the National Portrait Gallery – a retrospective of William Morris and his legacy; how ridiculously perfect, as though it had been put on just for me. 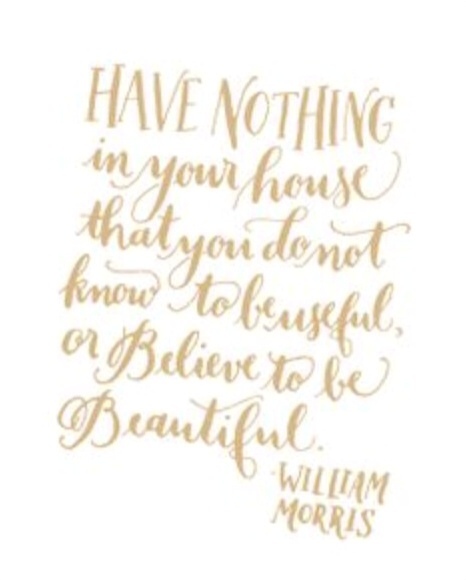 So why was Morris – artist, writer, poet, designer, visionary and revolutionary – such a key-player in my journey? Well, he first popped into my consciousness when I was a young teenager, at the point when his work was enjoying its 1980s revival, and I was immediately attracted to the rich embellishment of his designs and the velveteen lushness and mythical quality of pre-Raphaelite art, contrasting markedly, as they did, with the hang-over of 1970s culture and the stark functionality of my childhood home. 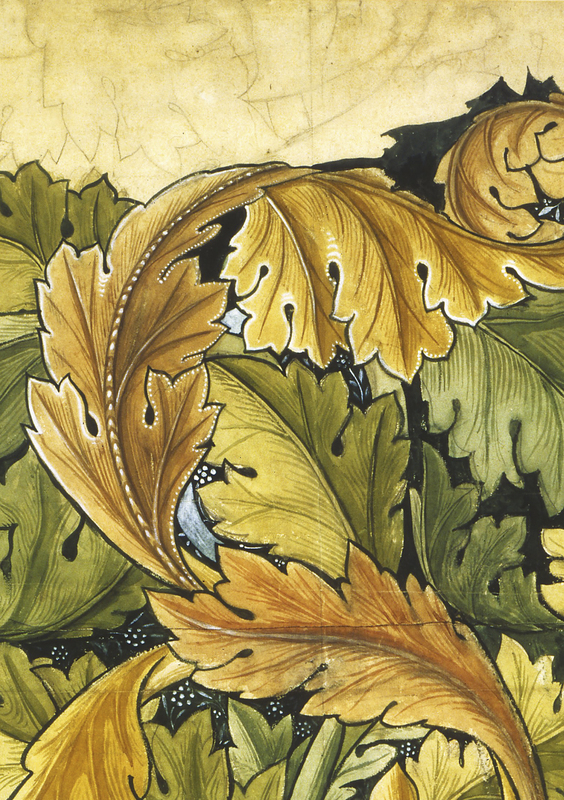 I sank myself deeply into the whole flavour of Morris, the Arts & Crafts Movement and the pre-Raphaelites and so began a love affair that has lasted a lifetime, for all I have long since moved on from the medieval undertones that are Morris’s trademark. 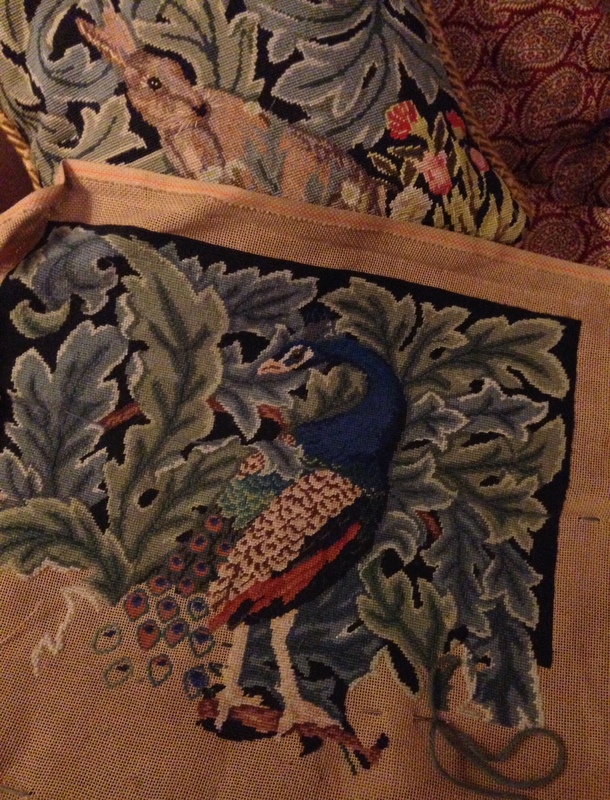 A fan of doing needlepoint at an age when my peers were enjoying racier pursuits, I even set about reproducing some of his work for my first house and still have an unfinished peacock that I last worked on, probably, 15 years or more ago (certainly before my daughter was born), though I’m newly wondering if I should pick up its dangling thread… Recalling how, as a young adult I would often stitch away late into the evenings by my fireside I see how, for a while there, I lived the Morris ideal, fixed on creating beauty and never with idle hands. 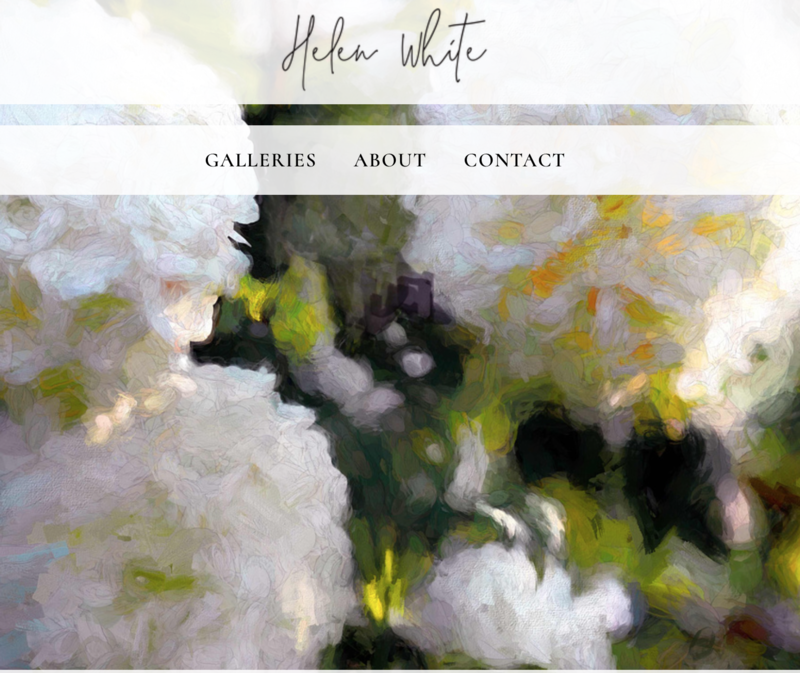 By the time I was thirteen, my hobby of choice was to be endlessly working at beautify the living-space around me; forever renovating and breathing new life into old sticks of furniture, transforming my world using remnants of material, sample pots of paint and my own handicraft and ingenuity to carve out rooms that were as beautiful as they were functional. I also collected all the freely-available things that I found beautiful in nature; for instance, I had a peacock’s tail feather found in the grounds of Lord Byrons home at Newstead, picked up off the lawns right next to the ruined abbey, and which I kept in a vase opposite my bed, for all my mother’s hand-me-down folklore told her it was ‘bad luck’ to look at it (funny how we have been kept away from some of the most remarkable things and places, for so very long, by such cursory tales). To this day, I collect rocks and fossils, crystals and feathers…laying them out in bowls all around my home. Looking back, I see that Morris started me off on my love affair with wallpaper; one which continues today, as well as a passion for decorative surfaces of all kinds; cushions, textiles, ceramics, coloured and stained glass (I have Burne-Jones’ “Three Graces” projecting afternoon colours onto my white tiles through my kitchen window). Creating a visually stimulating space in which to live became a whole way of life that led straight into my long-running passion for the Bloomsbury Group and their experimental, art-fueled way of living at Charleston. It also fed my own long-held belief that art is a living, breathing, domestic thing that you surround yourself with daily, feasting your eyes on it when you tip out of bed in the morning, just as you would pull the curtains to admire the leaves turning on the autumn trees outside in the mist; its not to be kept for highdays and holidays. This is a vision of art – kept alive through colour and texture, through handicraft, through domestic application, through familiarity and use (and kept well away from pretentiousness or the need to explain ‘meaning’) – that was shared by William Morris and so, in him, I felt like I had discovered a kindred spirit as I matured into my young-adult self and a way of looking at the world that puts beauty at its very centre. So, in what felt like as much homage to, and retrospective of, my own journey, we spent Monday afternoon feasting on a well-curated display geared at taking us through the wider implications of Morris’s vision of a world that prized beauty and function above all else. Well yes, indeed, I was brought up in a household where the worst condemnation you could receive from my mother was her declaration that something (or someone) was “neither use nor ornament”…and yet there was little space in my overcrowded childhood world for anything that wasn’t functional alone, ornament being the lesser priority in such a modest-sized house with four ‘children’ (three of them pretty-much adolescents by the time I arrived) and two adults crammed into three bedrooms and one living space. Yet, for all that my childhood world was functional at the expense of beauty, it was also a haven of handicraft and cottage industry – a great deal was crafted or repaired in my father’s shed, we grew all our own veg, our bread was home baked, our tomatoes and runner beans preserved – and so I did find something familiar amongst the displays at the NPG as I arrived at the section about Garden Cities. 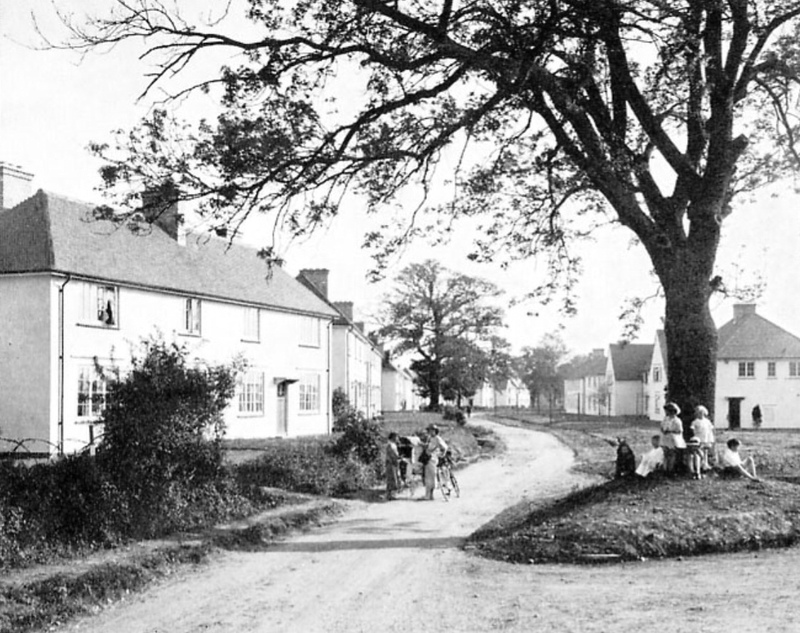 In the ‘new’ early twentieth-century towns of Letchworth and Welwyn, the arts and crafts movement had spiralled out to become a vision for a whole new way of living for ‘ordinary folk’ in well-planned housing developments that incorporated views of green belt and with good-sized gardens that brought the attributes of cottage living back into volume housing. It was a principle that fed straight back into the broader trends that were informing housing designs for much of the 1920s and ’30s in a way that had a profound effect on my own childhood. The house that I called ‘home’ for eighteen years and beyond, and which my father had lived in since it was nearly new in 1936, had a large back garden and a decent-sized front garden with a picket fence; in short, it didn’t look too dissimilar to the innovative ‘new’ housing of Welwyn Garden City in this picture. By the time I came along, the woodland that my father could still recall being opposite our house had long since been replaced by another housing estate beyond the street sign that declared that this is was “Robins Wood Road” and yet the layout of our estate, with its long back-to-back gardens and circular cul-de-sacs with green spaces in the middle, gave it a feeling of natural spaciousness that so many modern housing estates lack. The cottage feeling that it had, the fact my happiest hours were spent listening to bird song in a garden you could lose yourself in and that we enjoyed the kind of homegrown self-sufficiency that suggested we were safely tucked away from the ravages of the world made all the difference, I believe, to how my childhood ‘felt’, for all we were anything but well-off. To my father, this was his castle, being a far cry from the dingy terrace with a back alley and outside privy that he had spent his childhood playing around in. Realising anew that this style of housing owed its inception to visionaries such as William Morris made this the most thoughtful part of the exhibition, for me. So, here I was in London’s National Portrait Gallery feasting my eyes on oh-so-familiar Burne-Jones and Rossetti originals and richly decorated furniture, wallpaper and tapestry designs…and being taken through the impact these had on twentieth century architects and designers, through the Festival of Britain and the likes of Conran, right up to the present day…and then, a couple of days later, I was standing in William Morris’s own ‘house by the Thames’. I could hardly have planned my accidental week any better! As soon as we passed the quaint little bridge next to the Trout Inn, it felt as though we had arrived in the Cotswolds of William Morris, and we had. Peacocks abound wherever William Morris has been and Kelmscott Manor was no different, from brass peacocks in the fireplace to fabric and wallpaper designs and to the peacock blue of Jane Morris’s blue silk dress in the Rossetti painting that it was an absolute thrill to see ‘in the flesh’ (I literally couldn’t take my eyes off it). 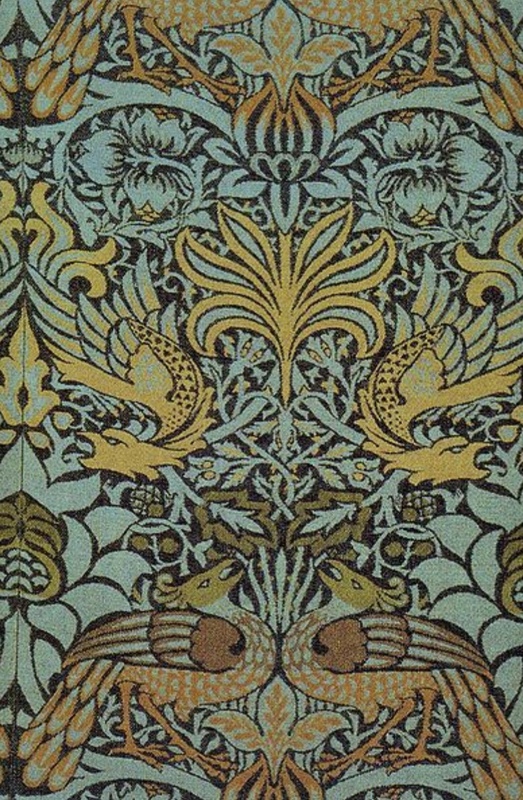 Oh, and of course, dragons; one of William Morris’s favourite designs was his ‘Peacock & Dragon’ design (above) of 1878, used to cover two armchairs by one of several fireside, although it was expensive to produce, being woven rather than printed. His inspiration for such designs came from some of the very earliest scraps of woven textile that could be seen in a museum at the time (Islamic as well as Christian), in which these symbols abound; the peacock as a long-time symbol of immortality and of alchemy, of the full nature of our potential, the dragon the primal forces we have come to fear instead of remembering how to work with them…such big themes contained by such little scraps of textile and now perpetuated by Morris! Kelmscott was a lush and sensual delight, inside and out – all the rich texture, colour and intricacy of this most homely of homes somehow mirrored by (and mirroring) all the lush acid-yellow and burnt orange leaves pressed against wet window panes and glossy rain-dripped berries of cottage gardens on our walk through the village and across fields. 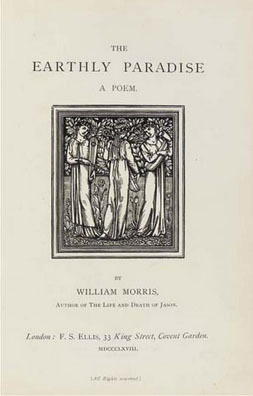 Is it any wonder Morris considered Kelmscott the house of his ideals, imagined once in a dream; everything about it – its honeyed walls, its cosy spaces and its natural setting – an homage to everything he held most dear in life; aspects of life that he believed everyone, without exception, should have access to. Muddy boots left in the porch, fire burning bright, art and embellishment glowing from the walls and from every curtain and seat cover, well loved books on the shelves – this was my sort of world, which is why visiting Kelmscott (at last) felt like tying a knot at the end of a long colourful thread that has run through me for years. If such a cosy and comfortable world exists anywhere, it resides in the Cotswolds, which is why I love this gentle part of the world with a passion and keep coming back to it. Staying in my favourite ‘centre’, Chipping Campden, we spent three days feasting our eyes on honeyed stone turned only more golden by the low-pitched October sunsets that start happening by mid afternoon, casting their long shadows and setting rooftops ablaze. It felt – as it always feels – like arriving home. So onto another thread sent weaving through my experiences and reaching its own cast-off knot in this week of many conclusions. For day two, we planned a visit to the nearby Rollright Stones; another place off my bucket list and even more so since some research into Chipping Campden, earlier this year, tied it into my growing fascination with ley lines; those ‘mysterious’ energy lines that forge distinct paths across the landscape. These energy lines abound in the Cotswolds and so I knew I was in for a treat. Around the time we visited Avebury and White Horse Hill in the spring, I did some research into the ley line that runs all the way from Land’s End, in a straight line, to the Norfolk coast. Actually, this line cuts an even more interesting trajectory from Mont Saint Michel on the Norman-Breton border and across Saint Michael’s Mount off the Cornish coast – aligning with the path of the sun on 8th May (the spring festival of St Michel), hence its name the St. Michael Line. Yet this isn’t the only reason it is so called; another being that it has been found to be typical of churches built on the site of pre-Christian sacred sites that these be dedicated to St. Michael; chosen, no doubt – as the angel of ‘protection’ and the one considered to have taken on ‘the devil’ (often depicted as a dragon) – in order to neutralise the pagan energies in such places. This phenomenon was first noted by John Mitchell, who re-discovered the St Michael Line in the 1960s and noticed the propensity for shrines and churches along this line (including Glastonbury Tor, Barrow/Burrow Mump near Glastonbury, St Michael’s church Clifton Hampden and Brent Tor Dartmoor) to be named after St Michael’, suggesting a proliferation of ancient sacred sites along this route. So what began, presumably, as an early-Christian attempt to purge the original ‘pagan’ significance from these sites served, in the longer term, as the very detective clues that brought them back to our attention, having ‘protected’ and kept alive the very evidence of their existence for all this time. It seems that Michael has, indeed, been protecting things rather more diligently than the early Christians bargained for! Fascinated with the idea of ley lines and sacred sites flagged up by the clue in a name, I poured over the St. Michael ley line and ticked off, with relish, all those places along its stretch that I had been to in my life; some, very significantly, corresponding with some of my life’s most momentous turning points and milestones, even my honeymoon spent right on top of it. This very significant energy line seemed to have been playing out as an equally significant life line woven through the very tapestry of my own life! 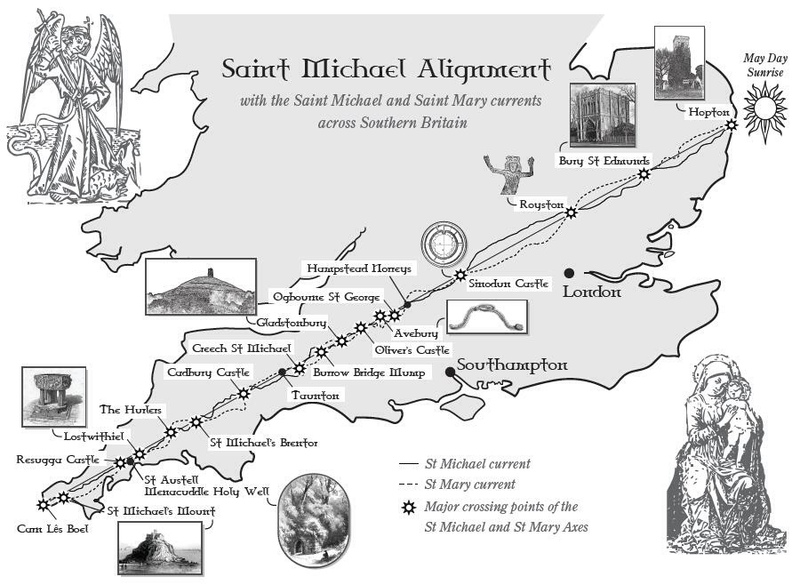 More, the reason the St Michael Line is also known as a ‘dragon line’ is because it interweaves with another energy line, of rather different qualities, known as the St Mary line, that runs alongside it. The Chinese coined the term ‘dragon line’ centuries ago to describe this kind of interweaving of more than one energy line, describing how, in places where these energy lines cross over each other, they create a massive vortex of energy; a kind-of two-in-one super effect like the yin and yang brought back together into wholeness. One such place is in Avebury, where it is said twelve lines (including the St Michael and Mary lines) meet and another is Dragon Hill at the Uffington White Horse. I have been to both of these sites this year and experienced incredible energy surges in both places; far more so than on any previous visits, as though the time had come for the energy rising up from the earth in these places to peak back towards fuller intensity (not such a very hard thing to conceive of in a year when the intensity of external energies experienced has peaked in line with the sun reaching solar maximum). So, what acts as the perfect conduit that bridges between earth energies and cosmic energies, the physical and the spiritual realms embodied in one form but, of course, us living out our ‘little’ human lives, going wherever we happen to go, doing what we do, hanging out in places that we love to go. It seems an awful lot of people have been attracted to these ancient, sacred sites, over and over and over again – across a massive extent of ‘history’; (I will come back to the question again later but) why is that? It was Hamish Miller and Paul Broadhurst who, in the 1980s, as they set out to dowse the St Michael lay line, tripped upon the existence of a second line running alongside it and, as above, crossing over it at certain key points. According to experienced dowsers researching this route, these two lines had different qualities; ones which could be classified ‘male’ and ‘female’ traits; the Michael line going across a lot of rugged terrain – and all those churches names after Michael while the other line running through watery places, particularly tranquil spots and with a lot of churches dedicated to the goddess-energy turned Christian that is Mary. It was around the time that I was reading into all this that I tripped upon a ley line linked to Chipping Campden, which made me jump as it is (yet another) favourite haunt of mine, one that had drawn me in like an old friend the very first time I visited; so much so that I was literally longing to go back for another visit, which is why we planned last week’s holiday there. So, now, here I was cosied-up in a fireside armchair in Chipping Campden, after a day spent at Kelmscott, listening to the bells of its auspiciously positioned church chiming-in the hours, planning my visit to the Rollright Stones – and so I did some more reading into exactly what I would be seeing at this ancient site and this is what I came across. The Rollright Stones complex is made up of three distinct sites; what are known as the King’s Men circle, the King Stone and the Whispering Knights (all of which sound like they could be characters fallen straight out of one of Morris’s collections of poems). The stone circle itself – with a total of what is believed to have originally been 77 stones – has attracted the majority of interest and speculation over the years, particular via what is known as The Dragon Project (and so here we go with dragons again). This project recorded a variety of electromagnetic anomalies within the circle of stones, including a spiral of concentric rings of distinct male or female energy, as though it were some kind of portal or entry/release point relating to the earth’s own energies. Several ley lines have been discovered relating to the Rollright Circle, one passing through Chipping Campden, another connecting it to the Uffington White Horse in a perfect north-south orientation. An avenue near to the stones correlates to the Jurrassic Way, which was a prehistoric trade route, and it is typical that ley lines correspond with these ancient routes that were so well-worn by many feet, long before the appearance of modern motorways; so which came first, the energy line or the feet? My research into the more far-flung ley lines that stretch beyond English soil, in an attempt to reconcile them with some of my continental travels, drew attention to how many ley lines correspond to what were the ancient salt routes that once criss-crossed the land – that is, the most well-travelled routes that were once used for the transportation of important life commodities such as salt, going back to very ancient times. Using this route of enquiry, I was thrilled to discover that the location of our most recent ‘overseas’ holiday, Lourmarin, was a town that ‘came about’ as a result of being a stopping point on a main salt-route over the Provence hills since, probably, Neolithic times. To get to Lourmarin, we travelled by train to Avignon and spent the final day of our trip in close proximity to the Popes Palace there – so called because the pope relocated (for political reasons) to Avignon during the fourteenth century; to a place selected, so its said, because of a ley line that directly connected Avignon to the energy of the Vatican. So, it seems, I can’t even keep away from these ancient routes myself when I ‘choose’ my holiday destinations; its as thought they are magnets, drawing me in, pre-selecting destinations for me. 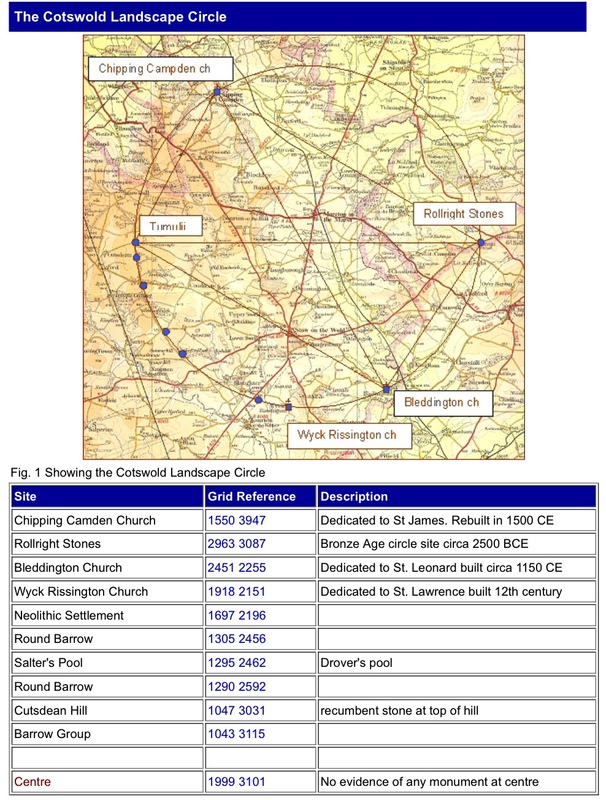 Going back to David Furlong and his circular ley line, the entire route he draws out is littered with Neolithic sites and long barrows, with seven ‘key sites’ that he particularly discusses. Again, ancient routes criss-cross these markers on the landscape – the Fosse Way (thought of as a Roman road but almost certainly predating that era) cutting diagonally across the circle, within 200 metres of its centre point. The Fosse Way runs through Bath which is, guess what, somewhere we visited less than six months ago and the location of our next mini-break. Another ancient route that runs along the circle, for a distance of about 10 miles (in such a distinct way that it was what first drew David Furlong’s attention to the existence of a circle) is the one known as Buckle Street, which is an ancient salt route, with the particular landmark on the circle’s route (a round barrow) being a place called Salters Way. So, back to our few days in the Cotswolds, so far we had spent an afternoon with William Morris (in spirit) next to his peacock and dragon bedecked fireside and in the gardens of Kelmcott and now we were at the Rollright Stones feeling into the energies at this remarkable site – and there was certainly something there, something more acute and concentrated than it is even possible to feel, I suspect, in a far larger site such as Avebury or Stonehenge. So we took our time in this intimate spot, bordered on three sides by trees and with the most expansive Cotswold view over patchwork fields on the other; in fact, we ended up hanging around there for far longer than all the other people who came and so quickly went, while the sky provided some incredibly dramatic displays and some extraordinarily pronounced beams of sunlight that stretched credulity as they ‘happened’ to come out of the clouds at just the right moment. There was no denying it; the atmosphere was really something (click the “stone” photo above to view the full album). If the Rollright Circle is a meeting point for male and female energies in a spiralling dance together, as I strongly suspect it is, then our party of four – two female, two male (one with four legs) – played that out amply as we wove our way around these stones and each other, each of us finding particular places we felt most at home to just stand and be, and then coming back together to stand in a loving family huddle at its vortex, with aeroplane arms and palms up-stretched, feeling the energy and taking it all in. There was so much laughter during the time we spent in that place and its as though we all wanted to spin it on for as long as possible before walking on to the Whispering Knights and King’s Stone nearby. When we got back into the car, a music track ‘randomly’ came on, out of a shuffle of my entire music collection, that seemed so fitting to the mood that had come over me from this visit; it was The Waterboys “The Song of Wandering Aengus” from the WB Yeats‘ poem of that name. “I went out to the hazel wood, Because a fire was in my head, And cut and peeled a hazel wand, and hooked a berry on a thread; And when white moths were on the wing, And moth-like stars were flickering out, I dropped the berry in the stream And caught a little silver trout”. Of course, the trout turns into a “glistening girl” and the story-teller spends the rest of his life in search of this idyllic being he has briefly encountered so that, one day he can “walk among the dappled grass, And pluck till time and times are done The silver apples of the moon, The golden apples of the sun. “ Those long golden days of dappled sunlight and perfect “sun-and-moon” balance that, at heart, we are all in search of, in our own very unique ways – is this what these ancient sites provide a taster of when we stand in their realm of influence; are they made irresistible to us by providing a glimpse of the pure magnetism of all that we already are but think we have lost grip of – like an elusive slippery fish – and so we keep seeking for that feeling all our lives, like someone on the longest quest? Is this why ancient footfall traversed these spots with such high regularity; because here, in these places, they were reminded of their own wholeness, their cosmic completeness while enjoying a tremendous ‘earthly’ view from the top of a hill or across a vast plane? Could it be as simple as that? Those lyrics continued to hang in my head long after I heard them because I know WB Yeats very well indeed; we were companions for a full five year period that he was on my curriculum through sixth form and my undergraduate years and yet I didn’t know this, until I looked this up: he was a friend and great admirer of William Morris, owing to him – so it is said – his more-measured grasp of poetic rhythm and, perhaps, some of the romantic subject matter (relating to vividly imagined, more idyllic and somewhat mystical times) that engaged the both of them. It turns out that Yeats’ sister Lilly worked as an embroiderer for Morris & Co. before she and her sister set up their own arts and crafts venture producing embroideries and printing books; and so my world just got smaller again as these two threads crossed over. After that, we spent an afternoon strolling around Chipping Campden in the late afternoon glow, listening to its church bells as the sun dipped its honeyed bricks in the amber light that is my resounding impression of our week. In the town, we discovered evidence of an arts and crafts off-shoot that had set up camp there, from the east end of London, in the early twentieth century – silversmiths, bookbinders, cabinetmakers, potters and more; the kinds of traditional skilled craftsmen that were enjoying a revival as a result of how Morris had made them newly sought-after. In the art gallery, at the site of the original arts guild, between a coffee shop and a stonemason’s workshop, I found two comic sculptures that I liked a great deal – both, by chance, and in very different ways, having something to do with a silver fish – and then, back in the main street of the town, we found a peacock sign hanging above a building with no clue as to what it was advertising; it could have been put there just for me. We had one day left to go and I knew where we would end up (more on that shortly) but there was time for one more visit. Instinctively, something in me cried out for heading ‘up high’ and so I found Broadway Hill; a Victorian folly on the top of (yes) Fish Hill, the highest point in the Cotswolds (in what is an ancient beacon site along one of the most ancient routes, Buckle Way, which passes right by the foot of the hill) and with views, so they say, of twelve counties on a clear day. And, wouldn’t you know it (we didn’t until the trip was already planned), it turns out that William Morris and friends used the tower as a summer retreat, and so our paths crossed over once again; it had almost ceased to surprise me. As we set off to the Broadway Tower from Chipping Campden, ‘The Song of Wandering Aengus’ came on again, from where it had left off the day before (and so became the unofficial song of the holiday, for me; playing on endless loop in my head). We walked the hill top (with its expansive views – click the image to view the full album) and enjoyed morning coffee at the Morris & Brown cafe and then, for lunch and our afternoon visit, we headed off to the piece de resistance of the entire Cotswold trip; a visit to the tiny (not all that auspicious by tourist standards) village of Stanton. Yet, at some point in my reading, I had hit upon Stanton and it had absolutely lit me up inside – for no apparent reason or maybe one of these: quite apart from looking like the most idyllic Cotswold village imaginable, it lies at the convergence of two ley lines and has…guess what…a St Michael’s Church. Its position also corresponds comfortably with the outline of David Furlong’s ley circle. For several months now, my sense of anticipation had been building steadily to the point I just knew this would be the highlight of our holiday. Only when we planned how to get there, from our hill top walk, did we discover that it was only three and a half miles away from Broadway (what were the chances of that) and, though Broadway village turns out to be the ‘prime’ tourist destination and even the painting location of a long time favourite works of art of mine, Sargent’s “Carnation, Lily, Lily Rose” (whose perfectly captured ‘amber light meets dusk’ composition inspired me, recently, to paint my own paper lanterns lit up in a night garden), I was not tempted to waste any time stopping off there on the way to Stanton. Stanton was all I hoped for and more (click the image, right, to view the full album); richly honeyed in the late afternoon sun, its Cotswold stone cottages were idyllic beyond belief as we strolled down the hill from the Mount Inn to St Michael and All Saints church to find a weathered Archangel Michael and an equally weathered sundial keeping watch over the entry. Even more amber light flooded through the windows to soften the gloom inside as we pushed through its wooden door and other Michaels appeared, carved into the rood screen and as one of the stained glass figures that included Archangel Gabriel, Mary and Mary Magdalene (like a gathering of old friends). The long-ago white washed walls of a puritanical urge had worn back in places to reveal a couple of small patches of brightly-coloured medieval fresco that would have made William Morris’ heart sing and, hung in interesting juxtaposition, a war memorial sporting a dragon, hinting at so very much fighting with ourselves that has been going on for so very long. Above the nave, the sun and moon symbols of an earlier era, well tucked away; and there were even (more) poppies, harking to the earlier part of my week, as the carved poppy-head pew decorations that had been noticeably worn way by the chains of all those sheepdogs that, at one time, would have accompanied many a man to church. Here was art that has been time-ravaged by its own functionality, mellowed down from its earlier perfection to where it gets to tell a story that we all enjoy hearing (not the kind that poppies normally get to tell), I smiled to myself; and, it occurred to me, where art gets to take the knocks of life, we don’t have to and it makes for a far gentler world. The light pouring into church windows was, at once, both golden and purest white (so extremely hard to capture with a camera) and I suddenly realised I was humming that song again: “And walk among the dappled grass, And pluck till time and times are done, The Silver apples of the moon, The golden apples of the sun”. 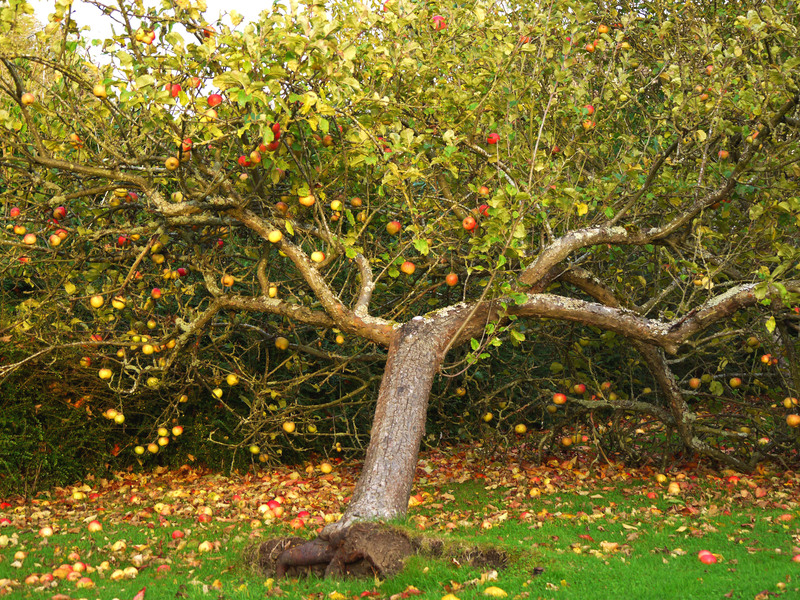 So we stepped back outside to where the sun, and temperature, had dropped another degree and where the light was even more mystical than before, falling in dappled patches on the grass and onto roses, red berries and, yes, a heavy-laden apple tree in someone’s front garden. These cottages, this little world in this timeless Cotswold village, seemed as though hallowed in the truest way imaginable (it was, after all, Halloween); all nestled and safe in a world wrapped around by hillsides, inviting your imagination beyond gateways and between flowerbeds to front doors you longed to step through, towards firesides offering the kind of ‘basic’ human comfort that William Morris declared was every man’s right. I felt, at once, like I deeply knew this place and that I could have stayed there forever; as though I had wandered so very far from this world and yet had never been away. As we continued our walk through Stanton in the magical light that just kept getting more amber-toned, as though gauzy cloths of gold were being layered across the sky, the brand-name on a burglar alarm – “Broadsword” – set me off singing, in my head, a song from my far-distant past, Jethro Tull’s “Broadsword”: “Bring me my broadsword and clear understanding. Bring me my cloth of gold as a talisman”. 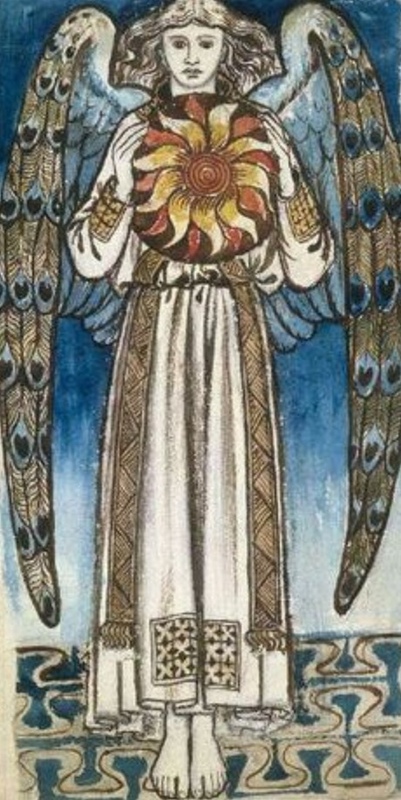 It took me a little while longer to reach my own clear understanding sufficiently to make the connection, especially with the St Michael ‘broad’sword of protection that I had just encountered in triplicate at the church, and then I laughed as I sensed all my themes come together at once; seeing, anew, just how culturally conditioned we have become to expect “a dark sail on the horizon” and to have to baton down the hatches against the world, clutching a talisman to our breast to protect us from…what? Yet, here in this peculiarly enshrined world at the convergence of lay lines I was witnessing a different kind of ‘protection’ in action; more akin to that which we all seek at the soul level and can create anywhere that we choose (and with whatever decorative flourishes we prefer); basically, its to be found wherever we get to lay down our boots and, like Hobbits, find comfort and shelter from wind and rain, food on the table, beautiful (not necessarily luxurious) things on which to feast our eyes, prioritising these things over some of the (many) run-away themes and preoccupations of our modern world. Its the slippery silver fish of such longing that we all seem to work so hard to hold onto, even for a moment, and spend so much of our life in some sort of quest for and yet its there already, just as soon as we get our world back into balance. Maybe, from such a viewpoint, we all get to see that our world is already just full of beauty and magic! So what of protection, of the need for a sword by our side? Perhaps its that we need protect ourselves from nothing so much as this – our own fear of what we most long for and yet what feels like it is all too much for us to ask for and accept from life, and so we tell ourselves we can’t have it and settle for less. Like the very dragons we have been set up to slay by our own fear-inducing culture, never questioning whether we want to slay them at all (or realising that the dragon is really us), we have become afraid of our very own desire for some of the simplest things in life; a life lived in balance in both dappled sunlight and winter shadows, beneath a simple roof made beautiful to our eyes, amongst friendly neighbours, lived in harmony with nature. Is this so revolutionary? 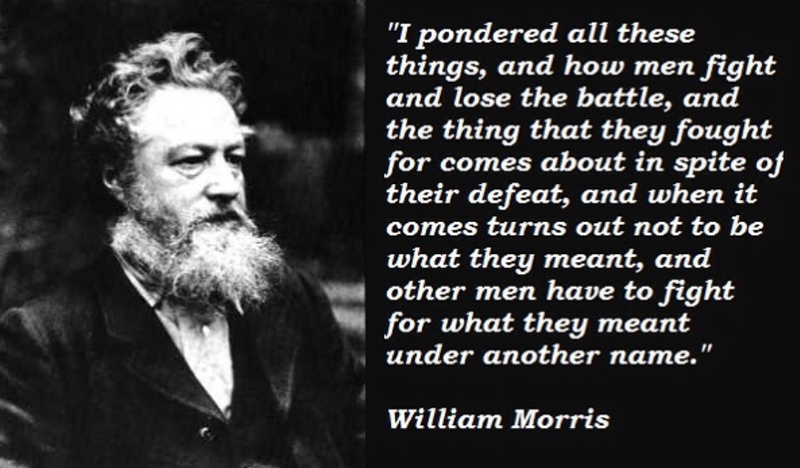 Because it is all that Morris was about; all he was advocating – not a return to a pseudo-medieval way of living, sitting around in parlors pretending to be lords and ladies or revering bloody battles and ancient heroics, not even surrounding ourselves with stale old reminders of the past – but comfortable, purposeful living amidst beautiful things. Like a golden apple hung on an ancient tree, he was simply encouraging us to reach back and pluck something off the bough of the way we once were, in a time when things were very much simpler and far more connected to the earth, so that we can bring it decidedly and resolutely into the now where we can bite into the very best bits of this fruit; taking only from the past what is relevant to us in the now and then creating it anew in the present. Isn’t this how I have spent the last few days – being presented with aspects of my past, through symbols and songs and half-forgotten interests of long ago, yet all newly relevant to the now as my week simply unfolded for me and I sat back and watched what it presented? It has begun to feel as though my entire week was stage-managed by somebody and yet who could that person be if it wasn’t the me that sprinkled all these clues and association, like so many breadcrumbs, across all the many years of my life. Is that what ley lines are; the energy paths that guide us back to the plug-in points that remind us of our own inherent balance; routes marked out by, what, a special feeling or is it all just the energetic footfall of the past, all the many people that have gone that particular route before and left their markers on the land? Perhaps (and I suspect) it is both, working together – we sense that energy and we are that energy; and as we recognise this in ourselves, we build that energy. Would we even know where to look for these energy portals if it weren’t for the clues of history that we have left for ourselves? So often – in fact, in almost all cases – my own encounters with ley lines have been ‘accidental’ through the following of my own inclination, my heart’s desire to go somewhere and then discovering the precedence that exists there. What does this say about me, my connection with all other beings and, indeed, all beings connection with each other? 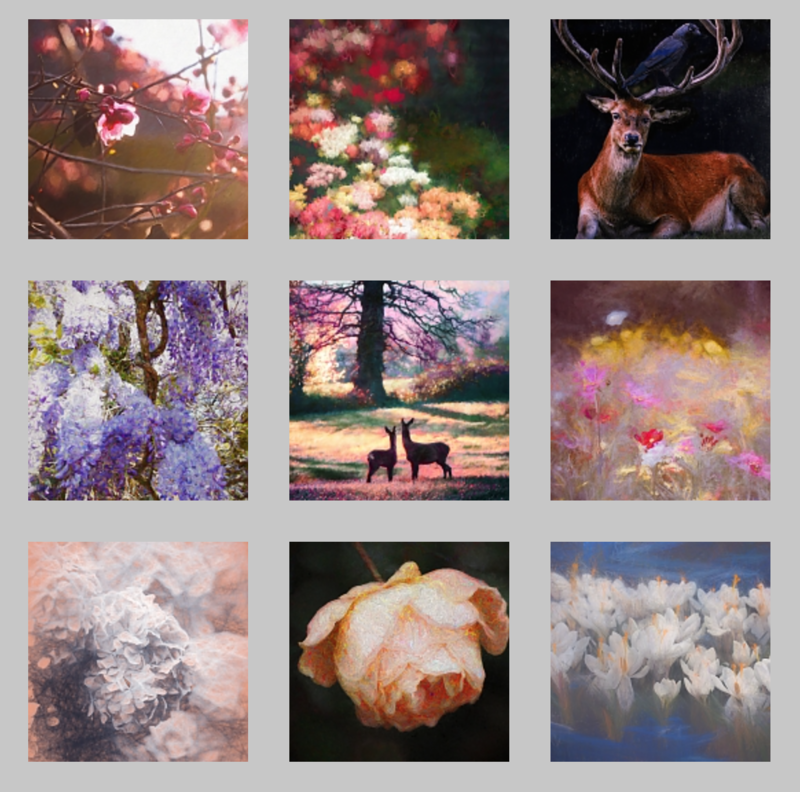 Like the world energy grid of ley lines that, they say, is springing back to life right now, are we not that energy grid in person, walking the earth, voting with our feet, connecting with each other, remembering all there is to remember about ourselves? Does this mean we have to hang out at ancient sites to plug into this energy or is it just that we, quite simply, get to be this energy in action, to beat out our own path on the earth with our feet, whichever way our hearts tells us to go, creating all-new energy lines that connect us all – and our positive intentions – the world over until everything is lit up? Perhaps the ancient people who created these land-markers did so in order that we could remember how to do this for ourselves, creating our own modern way of living in balance and harmony, living from the heart, revelling in beauty, being our own light. 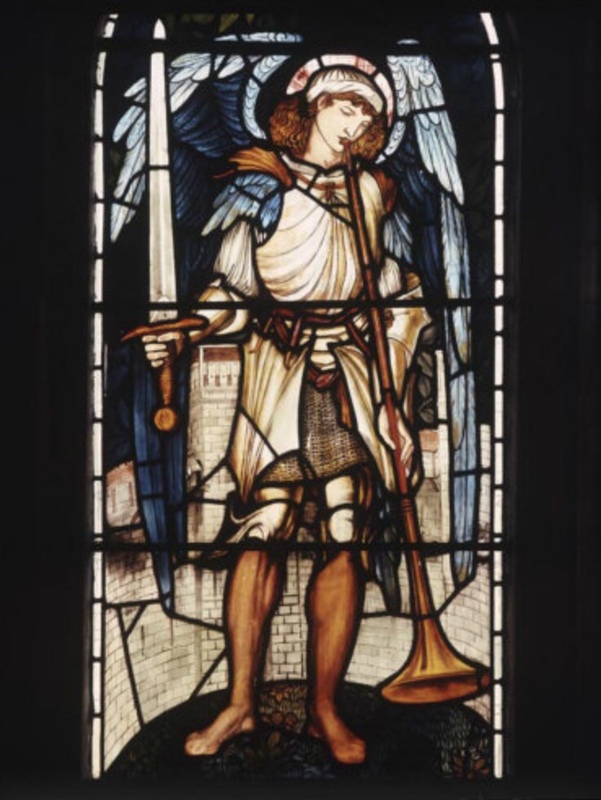 If this is why Archangel Michael has been protecting these sites for so very long then he’s done a wonderful job and, maybe, we have reached a time when the sword can be put down and the light allowed to flood in to all the hidden crevices. As the sun dropped down to its very last place-marker in the darkening sky of All Saints Eve to the sound of so many jackdaws gathering ready to roost for the night, and with such swiftness that our own bodies projected ghoulishly distorted shapes onto the path, my strongest sense was that its time to stop being afraid of our own shadow…time to give more time over to following our heart’s desire, surrounded by beautiful things and eating apples from both gold and silver trees (day and night, male and female, black and white…its all the same) as there really are no more missions, quests or dragons left to slay. As we drove away from Stanton (knowing we would be back), I reached over to photograph the setting sun on one side of the car, the rising moon simultaneously on the other. 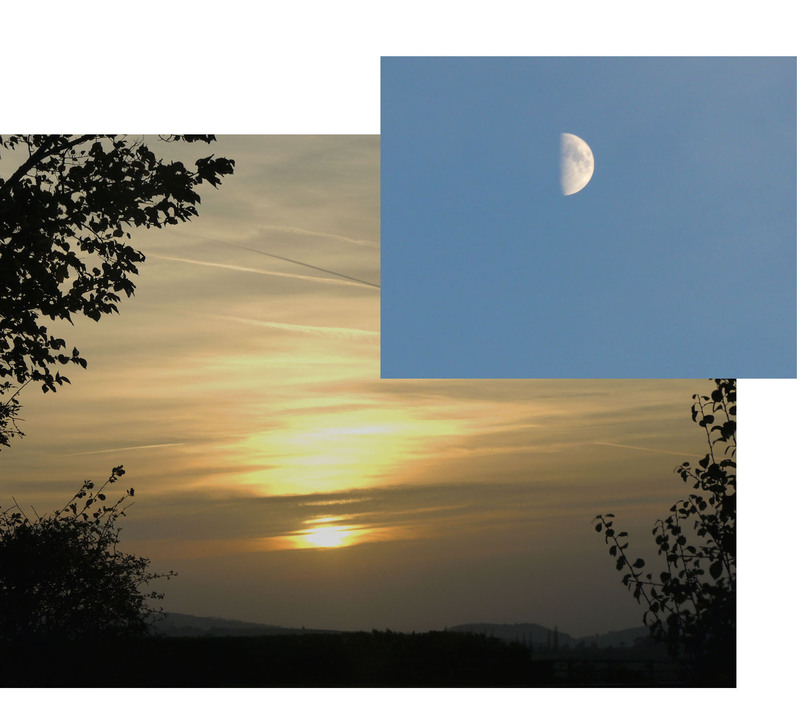 With the sun partially hidden by a misty layer of cloud and the moon a tiny fraction past its first quarter, it was as though they were modestly meeting each other at the half way point, the yin and yang of the sky. My very last photographs of the trip depicted a world in perfect balance. * I took my material about the Cotswold energy circle and some other ley line pointers from David Furlong‘s absolutely invaluable website, which I have accessed many times and which was fully functional less than a week ago when I was staying in Chipping Campden but which, for two days now, has been offline. I have attached the link via his name in the hope that it will be operational again soon as it is well worth a visit if you are interested in ley lines. David is author of The Keys to the Temple and Working with Earth Energies, amongst other books. This entry was posted in Ancient sites, Archaeology, Art, Art in the living space, Art purpose, Art technique, Artists, Biography, Consciousness & evolution, Craft & design, Culture, Divine feminine, Exhibitions, History, Holiday destinations, Leylines, Life choices, Lifestyle, Music & theatre, Nature, Personal Development, Photography, Spirituality, Symbolic journeys, Travel, Universe, Walks and tagged Anarchy & Beauty, ancient salt routes, Archangel Michael, Arts & Crafts Movement, Broadsword, Chipping Campden, comfort, Cotswolds, cursory tales, dragon lines, dragons, elusive joy, energy grid, Garden Cities, halloween, Kelmscott Manor, ley lines, living with art, Michael & Mary ley line, pagan sites, peacocks, Pre-Raphaelites, protection, sacred sites, silver fish, St Michael & All Saints, Stanton village, stone circles, sun and moon, symbolic journeys, symbols & meaning, tapestries, The Hobbit, The Rollright Stones, The Song of Wandering Aengus, WB Yates, William Morris. Bookmark the permalink. Helen, there were a lot of familiarities to me with this post, from your mother considering peacock feathers bad luck, to the phrase ‘neither use nor ornament’ to the fact that I grew up in a house built after the war and similar to the one you describe. But what a serendipitous week! I loved the education you gave me about William Morris and the attitude to life that inspired, the photos and words about the stones and ley lines. I also sought stones out this week – a prehistoric hill fort and rock art in Northumberland. Glad to have introduced you, lol and that you enjoyed my tour of the Cotswolds.